Spelt is an ancient species of wheat, high in protein and fiber, with a nutty chewiness resembling barley. It’s an excellent alternative to conventional GMO wheat. I frequently use spelt flour in baking, but only recently became acquainted with spelt berries. They’re easy to cook and perfect for anytime of day. Use spelt berries in lieu of risotto, orzo, couscous and the like. Throw in any seasonal greens and a bit of cheese and you have lunch for days. 1. Heat liquid over medium heat til it simmers, than lower heat slightly. If using water, salt generously. 2. Cook the spelt berries as you would risotto – add half a cup of liquid at a time, then stir until until the liquid is evaporated. Repeat til liquid is gone and berries are tender – about 30-40 minutes. 3. 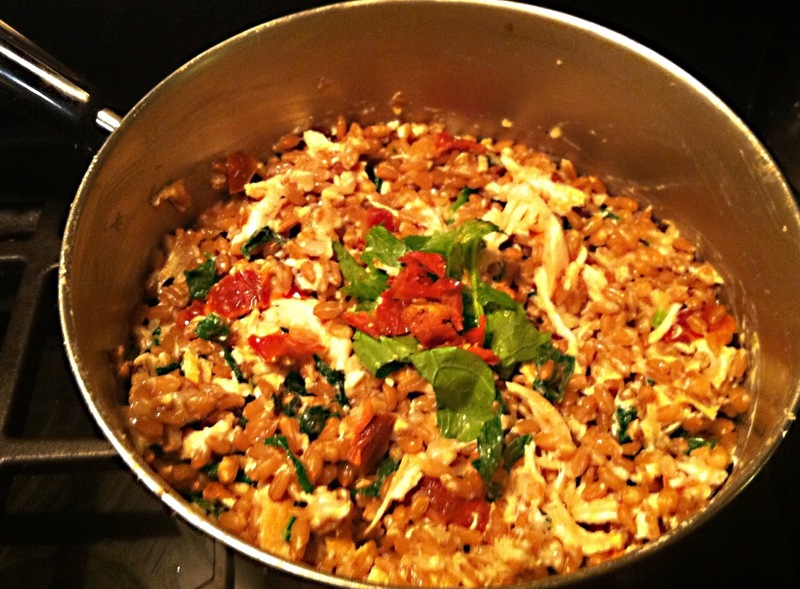 Quickly stir in shredded broccoli raab and sun dried tomatoes. When greens are wilted, stir in remaining ingredients than season to taste with salt and pepper. This keeps very well, so plan ahead if you want leftovers!